Come work with us on dementia genomics, looking for an early career data analyst! Laboratory name and structure: The Neurodegenerative Diseases Research Unit (NDRU) is part of the National Institute of Neurological Disorders and Stroke at the National Institutes of Health. NDRU is integrated in the Laboratory of Neurogenetics (LNG), a leading neurogenomics laboratory in the country. Principal Investigator: Sonja Scholz, MD. Laboratory mission: The mission of the lab is to apply modern genomic technologies to neurodegenerative diseases to identify and understand the genetic underpinnings of these conditions and their molecular relationships to each other. Diseases that we study: Most of our research is focused on parkinsonism and dementia syndromes, including Lewy body dementia, multiple system atrophy, Parkinson’s disease, and frontotemporal dementia. These are age-related neurodegenerative diseases that are still poorly understood. A genetic contribution to these devastating neurological conditions is increasingly appreciated, but the genetic underpinnings are largely unknown. Scope of research: The main analytical techniques include: large-scale genome sequencing studies, genome-wide association studies, pathway analysis, gene burden analysis, copy number analysis, repeat expansion tracking, machine learning and genotype-phenotype correlation studies. Ideal candidate: The data scientist (graduate to post-doctoral level) should have some training in bioinformatics. S/he should have a working understanding of population scale genetics, statistical genetics and the interpretation of genomic data. The applicant will obtain training in commonly used analytical techniques, including - but are not limited to - genome-wide association testing, gene burden testing, machine learning applications, cross-phenotype genetic analyses, data visualization and an interest in multi-omic data integration. A basic familiarity with computer clusters and cloud-based computing is ideal. Excellent written and oral communication skills and the ability to work well in teams are required. The incumbent will have a major role in assisting in manuscript preparation and bioinformatic training of other team members, providing technical assistance, and maintaining research continuity within the laboratory. Interested candidates should provide the following documents: cover letter, CV and contact info for up to three relevant references. 92 common genetic risk factors for Parkinson's disease! Great effort from a huge number of very smart people. Hampton Leonard, MS in data science joins the consulting team. Her work focused on machine learning and clustering within clinical trials. She is also interested in machine learning based predictions of disease progression and how that could impact drug development. She will be pending a majority of her time at the Laboratory of Neurogenetics, National Institute on Aging at the National Institutes of Health. If interested email mike@datatecnica.com. Should be an exciting opportunity for a post-doctoral researcher to work on projects relating to data science initiatives supported by the Michael J Fox Foundation while at the National Institute on Aging as a consultant. Let's make a difference in Parkinson's research. Please see the listing below. ...very enthusiastic about this publication. Solid collaboration between DTI, the International Parkinson's Disease Genomics Consortium and Genentech. Looking forward to the next one (already in the works)! Find it here. We just helped design another array with Illumina and co. Focused on neuro-degenerative diseases. The NeuroChip paper is out and the chip is available. 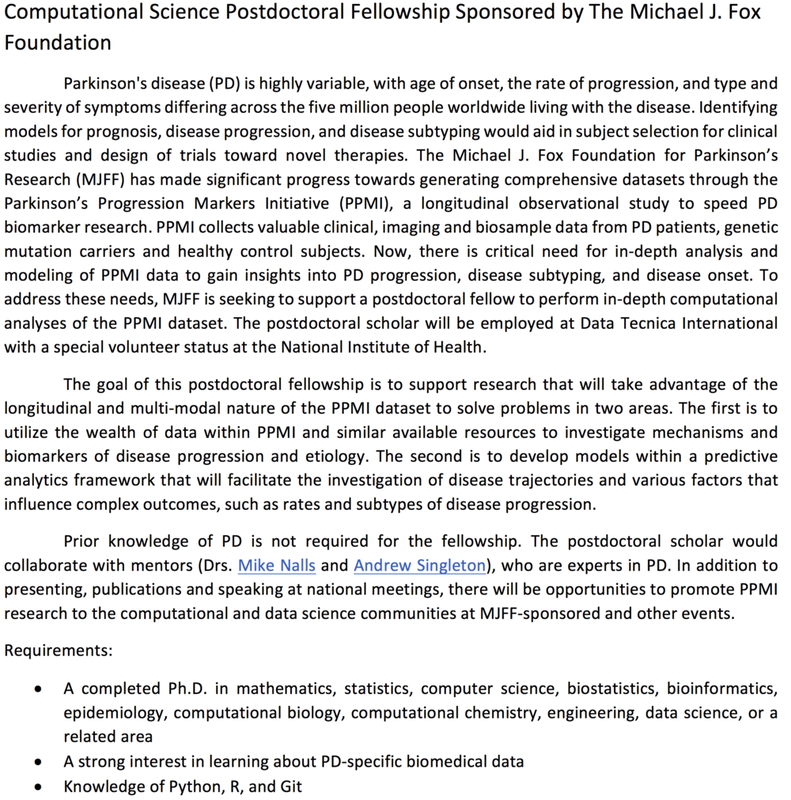 If you are interested in working in-house at MJFF to direct the development of their growing computational science portfolio, please see below and follow this link. The Michael J. Fox Foundation for Parkinson's Research (MJFF) was founded in 2000 with one clear objective: finding a cure for Parkinson's disease (PD) in our lifetime. The Foundation applies extraordinary scientific, business and media assets to this singular focus--thus creating a unique and dynamic organization. Since inception, MJFF has quickly grown into the largest nonprofit funder of Parkinson's disease research worldwide, having funded more than $600 million in research projects in academic and industry labs worldwide. We exist to put ourselves out of business, so we deliberately hold no endowment but instead spend what we raise quickly and efficiently; 89 cents of every dollar spent goes directly to research programs. Core to our philosophy is how we think of our capital and its risk profile relative to other stakeholders in the drug development pipeline. We work aggressively to de-risk various treatment ideas and tools in the hopes of building a robust pipeline of new treatments for patients. Today, the Foundation has about 100 full-time employees. The Associate Director, Research Programs, will play a key role in driving the MJFF research agenda. High-dimensional Parkinson's datasets ("big data") are emerging from deep molecular profiling and digital phenotyping studies that require novel analytic approaches to provide new insights into the disease. MJFF seeks a motivated and strategic scientist to support investments in computational approaches. This person will be responsible for developing and executing the MJFF research strategy in computational science for Parkinson's disease. Through working with external experts in the field, this position will develop novel and innovative ways to clean/curate/organize data, share data, analyze data, and translate discoveries into actionable biomarkers or targets. Working with domain experts, this position will create collaborative approaches to promote and establish multimodal analysis of large and diverse datasets. Success in this position will critically rely on a close collaboration with members of MJFF research teams, as well as management of key external players. The job requires a hands-on, detail-oriented, flexible, and solutions-seeking individual who is capable of delving into projects to support aggressive team goals, as well as the ability to manage and prioritize multiple projects simultaneously. This is a fulltime, onsite position located in New York City and is not conducive to telecommuting. Shaping of MJFF PD scientific "point of view". Developing and rapidly executing strategic action plans to address critical field challenges that consider both internal team and external advisor input and creatively position MJFF to have clear impact. Managing strategic plans at all stages from concept development, leading consortia meetings, grant review process, grant contracting and milestone management, troubleshooting and problem solving as issues arise. Developing strong relationships with research community and key opinion leaders. Reporting directly to the Director, Research Programs, and ensuring senior management and other MJFF staff receives current updates on key programmatic activities. Excellent independent decision-making and judgment skills. Creative, "out of the box" thinking. Strong project and time management skills with an innate sense of pace and urgency to get the job done. Ability to work productively and proactively, both independently and as part of a team. Strong interpersonal skills: ability to manage (often without authority) and be managed. Excellent written and oral communication skills, including ability and confidence in speaking to both professional/technical and lay audiences. Interested candidates should send a resume and thoughtful cover letter describing your specific qualifications and interest in the position. Submissions without cover letters will not be considered. Please, no telephone inquiries. Applicants who best match the position needs will be contacted. The Michael J Fox Foundation is an equal opportunity employer. Please see the attached request for services from the Michael J. Fox Foundation. If you are interested and capable, please email info@datatecnica.com and we can put you in touch with the right people at MJFF. Thanks. I'd like to put the word out for two positions relating to data science and bioinformatics that are hiring ASAP. Both are focused on genomics and neurodegenerative disease. The first is related to work being done at the International Parkinson's Disease Genomics Consortium (IPDGC) and the second is at the Laboratory of Neurogenetics at the National Institute on Aging. In both jobs, you will likely have to work with Dr. Andrew Singleton and myself as well as many of our close collaborators (this may be a positive or negative depending on your sense of humor). Job opportunity 1 <-- Data science and bioinformatics at the Laboratory of Neurogenetics at the National Institute on Aging. This is a full time position for a graduate student or post-doctoral fellow. Salary commensurate with experience. Preferred candidate has experience with / interest in statistics, linux and bash programming, R and / or Python, genomics and genetics, cloud computing and machine learning. Not all of these skills are necessary, as it is a position for someone to learn most of these but some familiarity would be beneficial. Hours are flexible and telecommuting is possible but expect to be available for meetings in the Washington DC area at least a couple times a week. This can be a multi-year appointment. This is either a part time position for senior researchers / consultants or a possible full time job for a junior level applicant. General scope of the job is to build and maintain an online database that will organize and store diverse *-omics data for the IPDGC. Strong background in database management, web dev and data visualization is preferred. R+shiny and / or python knowledge a bonus. This project will be ongoing so the appointment is likely multi year if possible and the position can be fulfilled remotely without set hours outside of weekly conferences. Please feel free to pass this on to any interested parties or lists. If interested, email mike@datatecnica.com.